Three people who died in a collision on the M40 in South Oxfordshire have been named by Thames Valley Police. 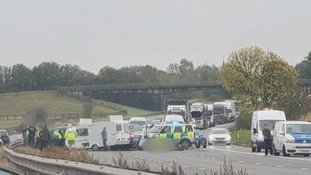 John Horton, who was 80-years-old and 87-year-old Olive Howard from High Wycombe, died after their Subaru Forester towing a caravan travelled in the wrong direction on the northbound carriageway of the motorway last Monday. The Subaru crashed with two other cars, a Ford Mondeo and a Ford Focus near junction 6. The driver of the Ford Mondeo, Stuart Richards, aged 32, from Stockport, Cheshire, also died.